For figurative artists, there is no greater canvas for angst than the human body. In “Pulse,” six diverse graphic artists and painters, ranging in age from 33 to 76, and each with their own distinctive focus on the figure, wrangle with a host of topics ranging from the most intimate of concerns to those screaming from the headlines. 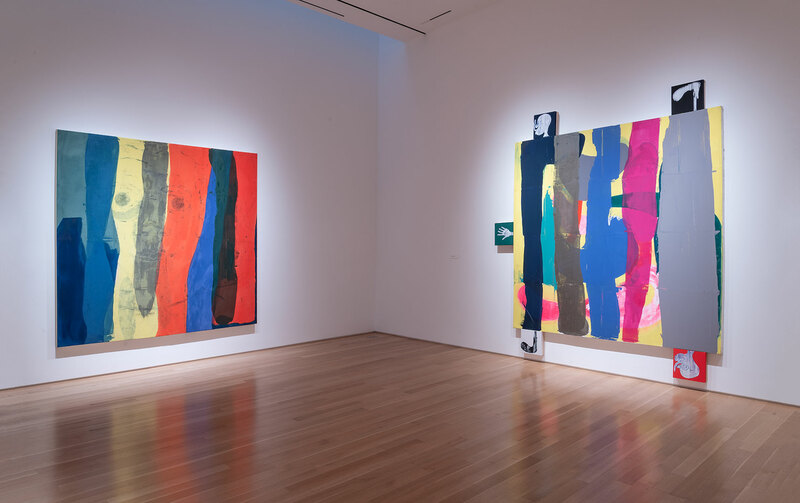 Their only commonality is a passion for color and a fearlessness in employing it, large scale. Aaron Wrinkle, a native of Aurora, Missouri, is a 2004 graduate of the Kansas City Art Institute and 2006 recipient of a Charlotte Street Foundation award. He has a Master of Fine Arts from CalArts and lives in Los Angeles, where he is also an actor and gallerist. He still maintains a studio in his father’s auto body shop in southwest Missouri. Also working in an autobiographical vein, drawing from her personal experience as an immigrant, Iraqi-born artist Hayv Kahraman depicts waves of stylized, Middle Eastern women in works such as “The Audience” and “The Kurds.” Exquisitely rendered in oil, with inclusions of gold leaf, Kahraman’s art summons up imagery of centuries-old Persian miniatures as well as newspaper photos of masses of faceless emigres. If Kahraman’s women are inscrutable, Heidi Hahn’s female figures in “The Same Kind of Story Told Backwards 1” and “The Future is Elsewhere (if it Breaks Your Heart)” seem to be melting literally from vulnerability and despair, caught in uncontainable groundswells of emotion. Katherine Bradford juxtaposes an impossibly lush, upbeat, sorbet-inspired palette with stick-figure images of humans — mostly faceless — caught in somewhat dubious states of action. In “Suits” a very large man in a grey suit hovers over a smaller figure in lavender swim trunks, while in “Stockpile” another grey-suited male sits in a chair, atop a giant gun, with a cache of big white snowballs. The personages in Bradford’s deceptively cheery facades seem undermined by an inability to take action, and in the vibrant “Talk,” two open-mouthed heads can only scream. All the artists in “Pulse” are marvelous technicians, and Toyin Ojih Odutola, born in 1985 in Nigeria, is surely one of the best graphic artists of our times. 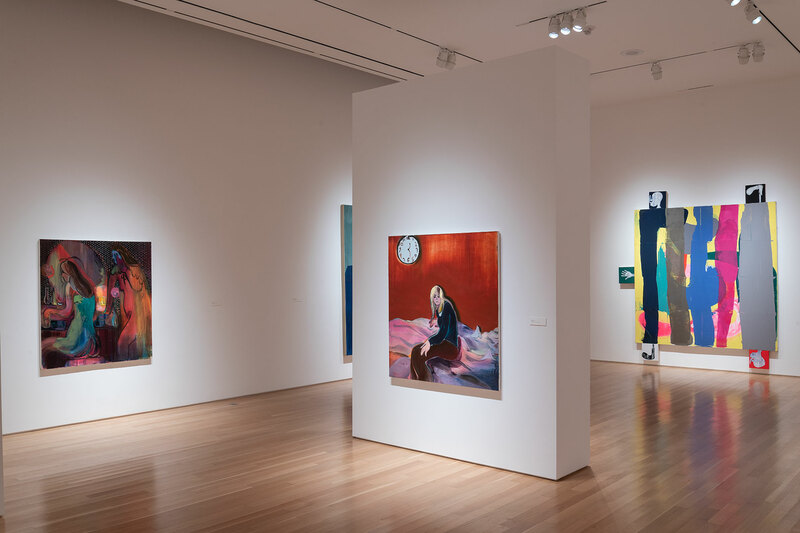 She has exhibited extensively throughout the U.S., including a one-person show at the Whitney Museum of American Art. (She now lives in New York). Her large-scale figures, male and female, drawn with charcoal, pastel, pencil, and markers, are all possessed of skin color that is magically, unapologetically, blue-black, iridescent, and gorgeous. Some of her figures display colorful little hashmarks on their bodies, almost like stars in the sky. In “LTS XI” from 2014, the heads of two male figures, pictured against a black and white background, wondrously blend in with their surroundings. In the 2017 “Gap Year,” a young (fictional) Nigerian girl sits pensively between two outdoor walls, while fields and water stretch endlessly behind her. In both works, no matter the perspective, the characters are embedded not only in their own skin but their environments. Odutola lets us see that we can become fixed in the places we live in, both internally and externally. 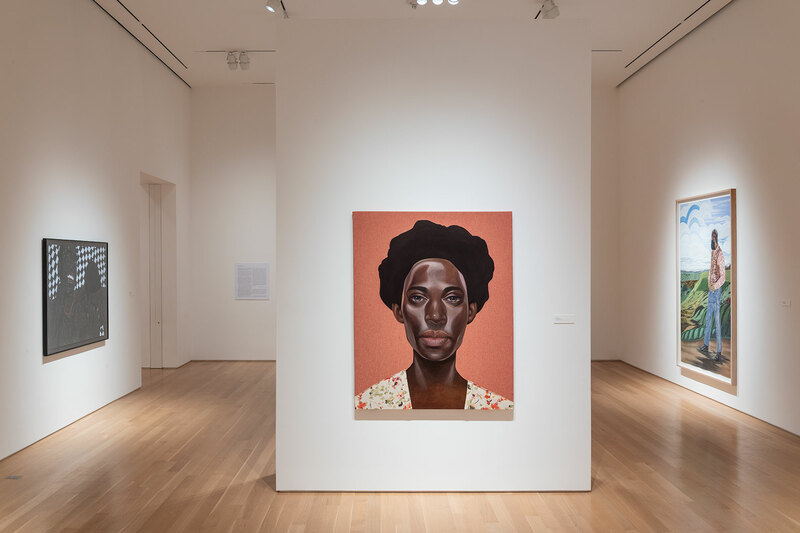 African-American portraiture has risen to the forefront of contemporary American art, and Ronald Jackson’s five paintings from his “Profiles of Color” series are a testimonial to its power. Jackson is a self-taught artist who retired from the military in 2014, and his work here is a revelation. His unique, deceptively simple, straightforward portraits are meticulously painted to appear as if they had been carved. 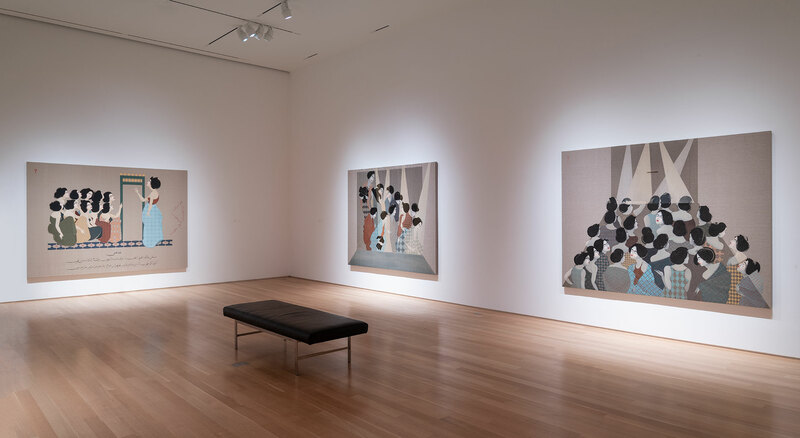 The men and women in his paintings look directly at us, and, although fictitious, they have important stories to tell. Some of his titles, such as “No One Knows Elaine,” refer to episodes from African-American history. Jackson’s art has often been inspired by the literary inventions of Magic Realism. 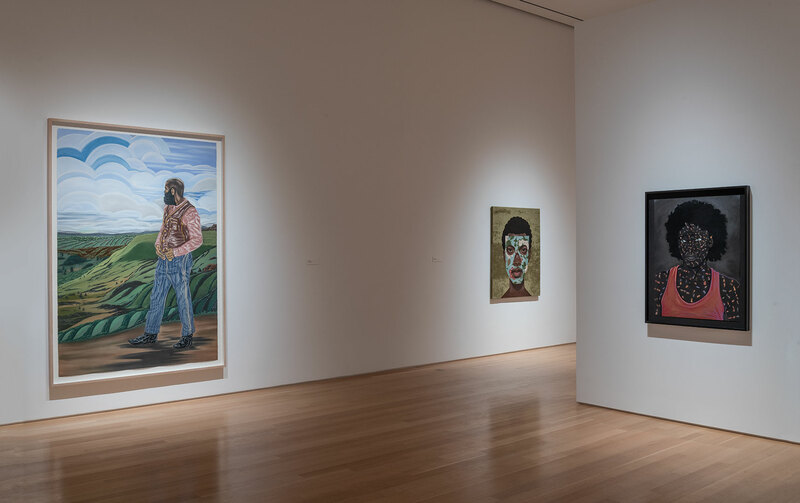 In “How Grandma Sees Me,” and “Elaine’s Girls Don’t Cry,” he incorporates masks of bright floral patterns over the faces of a young woman and man as a symbol for the interior beauty of his subjects’ souls. He calls these “collage portraits,” and they are some of the most unforgettable works from this exhibit. They leave one wanting to see much more of this artist’s work. 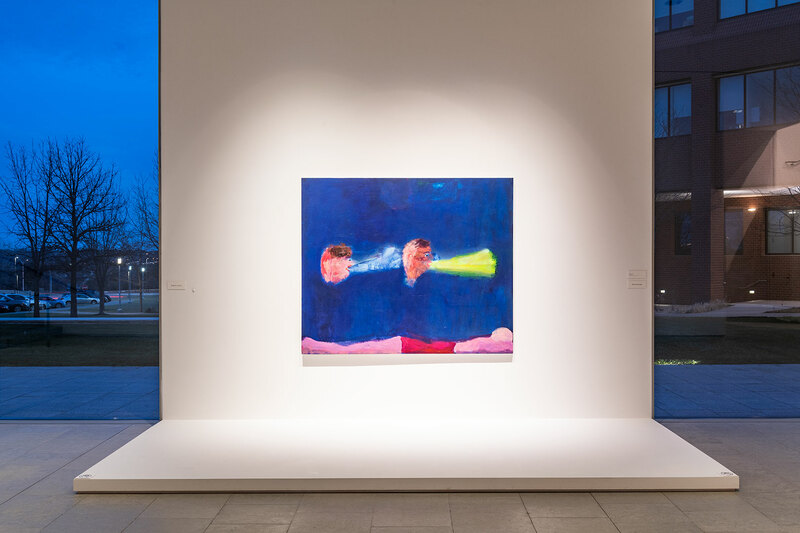 “Pulse” continues at the Nerman Museum of Contemporary Art, 12345 College Blvd, Overland Park, through Feb. 3. Hours are 10 a.m. to 5 p.m. Tuesday, Friday, Saturday; 10 a.m. to 8 p.m. Thursday; noon to 5 p.m. Sunday. For more information, www.nermanmuseum.org or 913.469-8500. The museum will hold an exhibition reception from 6 to 8 p.m. Jan. 31, with lectures by artists Katherine Bradford and Heidi Hahn at 7 p.m. Also on Jan. 31, “Pulse” artists Ronald Jackson and Aaron Wrinkle will give presentations about their work from 3:30 to 4:30 p.m. in the museum’s Hudson Auditorium as part of the Nerman’s Thursday Visiting Artists program. Elisabeth Kirsch is an art historian, curator and writer who has curated over 100 exhibitions of contemporary art, American Indian art and photography, locally and across the country. She writes frequently for national and local arts publications.